Fake Steve's blog started out as a learning experiment in blogging, and he figured he's use Steve to tell the stories he couldn't fit into the Forbes timeframe (months). He wanted to make money, but he couldn't exactly solicit ads, because he was anon. So he had the idea to make a book. He just plugged his book, asking people to buy it via amazon, and the Kepler's lady just gave him a dirty look, and a bit of scolding. How does he channel Jobs? He figures the wackiest CEO life ever. Then Forbes started writing about FSJ, without knowing that FSJ worked at Forbes. They offered a reward for his identity. ("...an iPod...hmm..I could use an iPod...") No one knew. Then he confided he was doing FSJ to a fellow worker, who told him he had to stop it or risk losing his job. So FSJ made up a story about Apple going after him as an excuse to shut down the blog. "FSJ couldn't make fun of the FCC while they were trying to go after him." It wasn't true, but the press picked it up as so. No one from Apple has ever contacted FSJ. He begged for a raise, from Forbes, but he was rejected. In the mean time, Wired started offering sponsorship. And then Forbes actually tried to hire FSJ as a columnist without knowing his identity. When they found out, he was pretty sure he was either getting a raise or get fired. Dan is talking about how happy and surprised he is the book reviews have been positive. Q&A: First question is mine. I ask if the uncovering of his ID was an Apple conspiracy via Google. 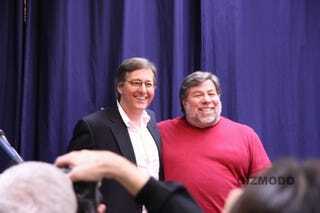 Woz says its possible, grinning. Now he's talking about VW, and how they were taunting each other over email. Owen is in the front row. They just smiled and said hello to each other. Dan is talking about how ridiculous it is to stand in line for things like $600 phones, though we won't stand in line against the war in Iraq. "Funny, but Sad." So true, so true. Did you write Fake Larry Ellison? "No I setup a friend of mine to write Larry Ellison. Two days into this vacation, where I promised I wouldn't work and went up to Maine I got busted for being FSJ." It ruined the trip. People thought it was over at that point, that FSJ wouldn't blog anymore. But he was just busy dealing with the business of being outed. What do you think of RSJ? "I really admire the guy. I wouldn't want to work for him, I wouldn't want to be a part of his family, but I'm glad he's here. I feel affection towards him, and i'm from boston, and if you're from boston and you like someone, you take the piss out of them." How do you feel about the journalists? "Some of them are in the room." Looks over at Owen, drinks water. Talks about Owen, and some of the stories that both VW and FSJ setup back and forth between each other as a great show. When FSJ calls journos Filthy Hacks, he hopes people see it as Self loathing. What do CEOs think about reporters? "I know, they kind of hate us." But some filthy hacks, he says, "I don't really like, but I'm not going to tell you who." Another Q: Once you were outed, did it affecting your ability to report on tech? I don't think I can do it anymore without some bias. "If I was at the Times, I couldn't, but at Forbes, an opinionated pub, I can." How do you know when you're being Steve and Fake Steve on the blog. "I understand the question. Fake Steve is the Third Character, who is more obnoxious." For example, RSJ wouldn't pay attention to Scoble, but RSJ would. Did you have any other help on the blog? No, except a couple of days of fake Larry. "I sometimes go back and tighten em up, but I leave em out there...with errors." Do you purposely misquote people on FSJ? "Yes, so they write in for corrections." The most commented post ever was the "What car should I buy?" post. Unexpectedly. Q: Did you invent Frigtard? "I thought I did, but I found other uses in google. I didn't want to say F-U-C-K in the early days. So I used Friggin and Tards and combined them. That's now been contributed to the Urban Dictionary. And so has "To Denton."" So does it take anything to get into the state of mind? "It does, ask my wife." Dan: "And not all that other stuff I added? I got that on Wikipedia."